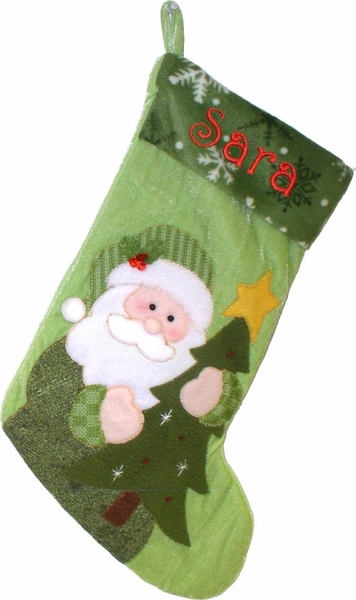 These designer Santa green Christmas stocking is just adorable. The materials are exquisite : the body is green velveteen and the applique S is Santa is a combination of knit, fleece and wool applique materials. There are red glass beads on the tree and Santa's hat that give it the extra touch of elegance. The cuff is made out of a soft fleece fabric. Measured along the diagonal from the top left hand corner to the toe, the stocking measures 19 inches, and the width of the cuff is 8 inches wide. Names can be personalized on the plush white cuff of this Christmas stocking with GOLD. RED or SILVER metallic embroidery thread to compliment the design of this Christmas stocking. We have a sample picture of the stocking personalized with festive metallic embroidery thread ... click on the thumbnail image in the top right hand corner of this page to see a larger version. This stocking is available in Santa and Snowman design so you can create a set decorating with similar items from the same designer collection. If the complimenting design still available, you will find it in the list of our Christmas stockings for sale. Each name is machine embroidered with the first letter in upper case and the remaining letters in lower case. For group orders of 2 or more stockings, we will do our best to adjust the font size of the letters so the monogrammed letters are uniform in size. For example, if your order has the names Mom, Dad and Christopher, we will embroider the longest name first and then adjust the font size of the shorter names to match the font size of the longest name, otherwise the shorter names will appear to be disproportionately large. If you want the largest letters available monogrammed on the cuff, please specify SHORT versions of names, such as Mom/Dad/Chris instead of Mom/Dad/Christopher. Please provide the names to be monogrammed on the stockings in the Personalizing box; separate each name with a comma. Select the font style in the Personalizing Method drop down menu.